Legislative curb on foreign law firms in Russian courts | Russian Legal Information Agency (RAPSI). 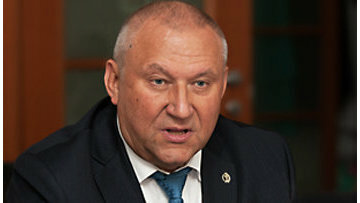 MOSCOW, April 21 (RAPSI, Alexander Panfilov) – There is nothing unusual in a legislative initiative aimed at limiting participation of foreign law firms in civil proceedings in Russian courts as numerous attempts to “normalize the situation” were made earlier, says Gennady Sharov, Vice-President of the Federal Chamber of Lawyers. Legislation amendments were proposed by Denis Voronenkov, a lawmaker in the State Duma, Russia’s lower house of parliament. He submitted a bill “On introduction of amendments to Article 60 of the Commercial Procedure Code of the Russian Federation and Article 51 of the Civil Procedure Code of the Russian Federation.” According to the bill, “a foreign state, an international organization, as well as an organization under their control, a foreign legal entity, a Russian legal entity with foreign investments, as well as employees thereof, foreign citizen” should be banned from representing parties in civil proceedings and commercial courts. However, under the bill exemptions should be made in accordance with paragraph 4 of Article 59 of the Commercial Procedure Code of the Russian Federation, paragraph 2 of Article 48 of the Civil Code. According to Sharov, “earlier attempts to normalize the situation were of scholastic, selective nature, whereas problems encountered in the sphere of provision of professional legal assistance need to be settled as a single set.” “First of all, lawyers should be granted an exclusive right for legal representation in court. The Federal Chamber of Lawyers has stated the necessity of this step more than 10 years ago. This proposal was taken into account in the Concept of Regulation of Professional Legal Assistance Market developed in the framework of implementation of state program “Justice”, the adoption of which unfortunately was delayed,” according to Sharov. He also noted that “legal representation is only a small part of activities carried out by foreign law firms, whereas cases are handled mostly by Russian lawyers.” Sharov also added that foreign citizens are allowed to work as lawyers in Russia. The explanatory note to the bill clarifies that it is aimed to stimulate the development of national legal representation. The author of the draft points out that the idea of putting a cap on participation of foreign law firms in court proceedings has been applied in China, India, Brazil, and Germany as national legal representation has become a priority there. The explanatory note also says that the necessity to introduce limits on foreign law firms activities has been ripe due to sanctions imposed on Russia by a large number of foreign states and negative macroeconomic climate. Participation of foreign law firms as consultants and counsels to Russian business raises risks of harm to the national economic security, since access to commercial secrets and analytical data is granted to persons potentially affiliated with foreign intelligence agencies, according to the author of the bill. The bill specifies that the limits should be applied only in terms of participation of foreign law firms in court proceedings, since “taking into account the observance of rights of business entities to competent legal assistance, it seems reasonable to retain the opportunity to provide advisory services in the sphere of international legislation for foreign law firms.” The author of the bill expects a reduction in capital flight from the Russian economy as a result of the proposed amendments. The draft law was brought before the State Duma Committee on Civil, Criminal, Arbitration, and Procedural Legislation on April 15, 2016. 11:01 21/04/2016 There is nothing unusual in a legislative initiative aimed at limiting participation of foreign law firms in civil proceedings in Russian courts as numerous attempts to “normalize the situation” were made earlier, says Gennady Sharov, Vice-President of the Federal Chamber of Lawyers.